Winter weather in Northern Ohio creates major challenges and safety concerns for commercial property managers. Whether your property is a retail shopping center, office building, medical/hospital facility, industrial park, apartment building, or condominium, you need a dependable, responsive partner to quickly and completely clear snow and ice from sidewalks, parking lots, and other walking and driving surfaces. Schill Grounds Management is one of the top commercial snow contractors in the nation. We are one of only 22 contractors to have achieved SN 9001 Certification. We have built a comprehensive system for snow management including a 24/7 call center and a weather tracking station. Our earth-friendly deicing techniques are less harmful to the environment and your property. Want commercial snow removal tips? Check out our comprehensive guide for property managers and owners. 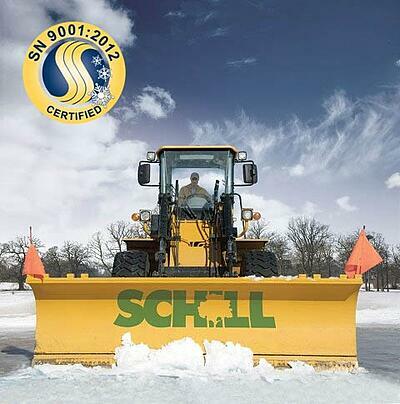 As only the second snow contractor in Ohio to achieved this certification, you can trust that Schill will provide you with the highest quality service. You can confidently choose us for Snow and Ice removal and know that our processes and quality management systems are proven to be of the highest industry standard. Do you own or Manage a commercial property? Request a no-obligation consultation TODAY! Schill's team of commercial landscaping experts can help you create and maintain beautiful, green outdoor spaces for your property. We can design and build a sustainable landscape for your commercial property. Our certified specialists keep your walkways and parking lots clear of snow and ice. Through our proactive C.A.R.E. Commitment, we strive to become your trusted, year-round grounds management resource. We are always looking for talented people to join our growing team of landscaping and snow management specialists.